The first of the three swords: "The Foil". It's overal length is upto 110cm, the blade being of a maximum of 90cm. the Foible the wobbly thin bit (rectangular section) which takes the stress of the hit. the funny looking loop is made of leather and called a Martingale, you place your fingers through it, so that if you loosen your grip you do not drop your foil. This is a safety precaution, not just for you, but for others in the area! 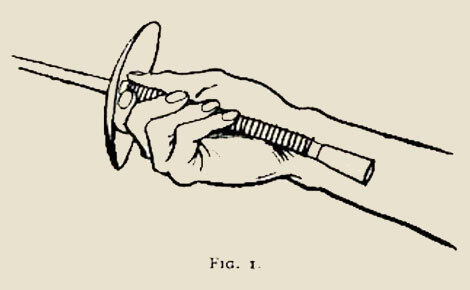 French grip is the classic hilt, and the best for learning finger control. Gardaire grip is nowadays an unusual “positive grip” version of the french grip. Combines good grip with balance. This example has an electric socket. 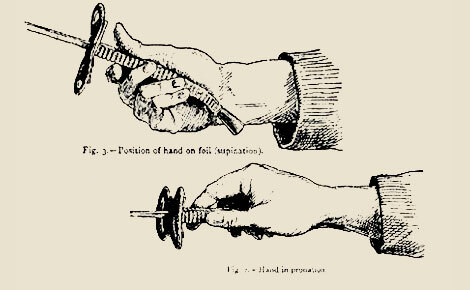 Orthopeadic grip is a more developed ergonomic form of handle. Pistol grip is presently the ultimate form of this trend in ergonomic forms. The competitor's favourite. This is also an electric version. Zicovic grip is a grip for the 21st century. Still new to the game, also known as "elephant's ear". Italian grip. Put in as a curio. 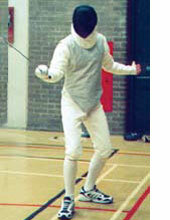 No longer legal in competetive fencing, but once a very popular type. It needed a wrist band to bind the hilt to one's arm. The target area for the foil is shown here in grey: it consists of the torso and "v" of the groin. ("ouch!"). The foil is a point weapon, hits are valid when the tip/button is pushed onto the designated target area with what is determined sufficient force (500 grammes and greater) to cause penetration:- if it was a real sharp weapon. Sideways hits are invalid. Hits only score a point if the fencer making the hit has the Priority. As in tennis one can only score on a service. Priority is given initially to the first person to initiate an attack, but it passes to the opponent after a parry. It is also forfeited by breaking the fencing time. Foil Mask: For electric foil the mask should have an insulative layer over the steel mesh, to prevent mask off-targets hits registering as valid. Foil masks are often, therefore, coloured black. Lamé: This is the conductive, metalised , target garment necessary for the operation of the electric scoring apparatus. It is wired to the score box (or light-box) by the groundwire and the foil by the body wire, seebelow. Body Wire: This connects the weapon, and the lamé to the ground wire. Here we see James in all his electric foil kit. Note the metal lamé jacket and insulated mask. Hilts, top to bottom: a 1960's Italian foil,a 1790 English small sword, and a modern French foil. Developed in the mid-seventeenth century, the Foil is the first, or eldest, of the three sport weapons. At that period, the smallsword was the fashionable dress sword in most european countries, remaining in vogue until the mid-nineteenth century. Learning to use it was, on occaisions, essential for survival, and using it with syle essential for courtly manners. In 1670 mon. Philibert de la Touche (a very appropriate name for a fencer!) first mentions the use of foils, at the court of Louis XIV in his "Les Vrays Principes de l'Espée Seule". (They were notable for their elaborate crown-shaped guards). 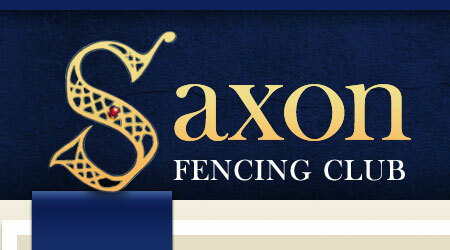 A fuller chronology of fencing history is to be seen on our fencing history page. Foil guards of 1891 as H.G. Willink illustrates H.A.Colmore Dunn's "Fencing; the All-England Series". In 1934 Cav. 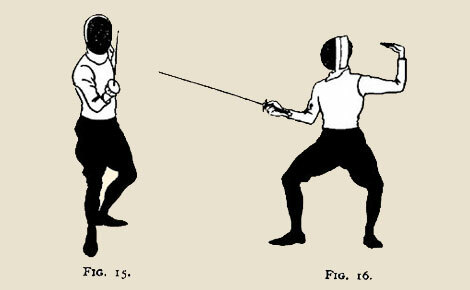 Léon Bertrand publishes his “The Fencer’s Companion” Below he illustrates the position of quarte for foil. Below a French grip of the same.